On January 15, 2016, Freight Farms delivered a brand new Leafy Green Machine to Clark University Campus in Worcester, MA, and it was an incredible site to see. While we’ve deployed the LGM to numerous college campuses over the past few months, this one was different. This university deployment was so unique because it holds historical significance for both Freight Farms and myself. Clark University is my alma mater, and is also the location of the first ever Leafy Green Machine prototype. In 2010, I was pursuing a Masters in Environmental Science and Business Administration through the school’s dual degree program, and around that same time I was trying to launch a brand new company with my co-founder Jon Friedman. That company was Freight Farms. Freight Farms was still in its infancy while I was studying at Clark, and was considered to be an out of this world idea. Growing food in a shipping container was a brand new concept at that point. But we were determined to bring it to life, and Clark University was instrumental in supporting our efforts. After running a successful Kickstarter campaign in 2012, Jon and I had enough funds to build a prototype and Clark University helped us secure the location on the school’s campus parking lot. So that summer, Jon and I went to work spending hours, days, weeks iterating on various design prototypes. We began growing crops in the Freight Farm and Clark helped us get that produce into the dining halls for students to sample. 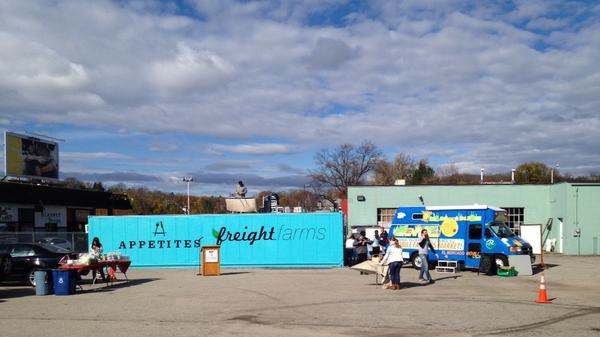 (They were spearheading the freight-farm-to-school concept before it was a thing!). On top of that, this gave Jon and I some perspective on how university food service works and helped us understand the nuances of getting local fresh healthy produce on campus. That fall we hosted a launch party for those curious about the big blue shipping container on campus. Local politicians, businesses, faculty, staff and students all came by to tour the LGM and support our efforts. It’s something I’ll never forget. Now fast-forward 4 years and Clark University is home to the newest version of the Leafy Green Machine. And it’s located just a few blocks from where the prototype was built. Things came full circle to say the least. Clark was able to give Jon and I the support to build upon our shared vision from paper to prototype and jumpstart the journey to where Freight Farms is today. I can’t think of a more appropriate way to say thank you to everyone at Clark than to put the ultimate manifestation of our dream to work on campus to feed future students.